Net Entertainment’s (NetEnt) monster-themed slot Frankenstein is one of the most lucrative slots thanks to its multipliers, wild symbols, and a top fixed jackpot of 1,500 coins. To start playing, players should first choose the number of paylines they would like to play. The slot has 20 paylines and a coin value range of $0.01 to $0.50. Players can bet up to 10 coins per active payline, which makes $100.00 the max bet for Frankenstein slot. After placing their bets, players can hit the Spin button to set the reels spinning. They will receive payouts if a winning combination of symbols is created on the reels at the end of a spin. Since Frankenstein is a NetEnt slot, it comes with a Skill Stop Feature that converts a game of chance into a game of skill. This feature allows players to stop the reels in mid-spin to capture winning combinations, unlock bonus features, and win extra prizes. Frankenstein is one of the several movie slots released by NetEnt. It is based on a Universal movie inspired by Mary Shelley’s novel of the same name. The slot, which was developed for the Halloween season, became so popular that NetEnt casinos decided to continue offering it. Frankenstein is based on the cult horror icon of the same name. The reels feature characters from Shelley’s book and astounding sound tracks and audio effects from the Universal movie. As players spin the reels, they will come across icons of brains, monsters, Dr. Frankenstein, and high-value cards. The slot owes its popularity to its brilliant graphics, amazing animations, and realistic audio effects. The Lightening Rod symbol serves as the wild, helping players complete winning combinations and win extra prizes. On the downside, it appears only on the second, third, and fourth reels and does not substitute for the scatter symbol. The wild symbols are special as they are linked symbols that appear all over the reels and convert at least two symbols in the neighborhood into wilds. During the free spins round, these wild symbols turn into Fire Wild symbols, which also appear in the linked form, spreading over the reels and converting at least two symbols into wilds. The Windmill symbol is the scatter. If players get at least three scatter symbols anywhere on the reels, the free spins round gets activated and players will receive 10 free spins with a multiplier value of up to x5. During the free spins, a special multiplier symbol appears on the fifth reel. Whenever this happens, the multiplier value increases by one till it reaches the value of x5. The free spins round can be re-activated while playing a free game. 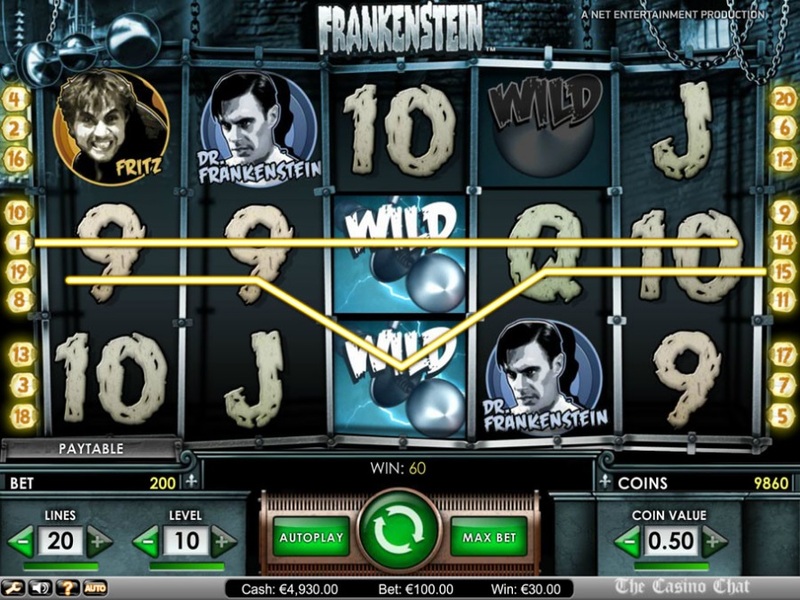 Frankenstein can be played for free or real money at any NetEnt online casino.